Violet thought she’d made peace with her unique ability to sense the echoes of the dead and the imprints that cling to their killers…that is until she acquired an imprint of her own. Forced to carry a reminder of the horrible events of her kidnapping, Violet is more determined than ever to lead a normal life. However, the people who run the special investigative team Violet works for have no intention of letting her go. When someone close to Violet becomes a suspect in a horrific murder, she finds herself pulled into a deadly hunt for a madman with an army of devoted followers. Violet has survived dangerous situations before, but she quickly discovers that protecting those closest to her is far moree to say goodb difficult than protecting herself. Kimberly Derting's Body Finder series continues to excel and impress me. 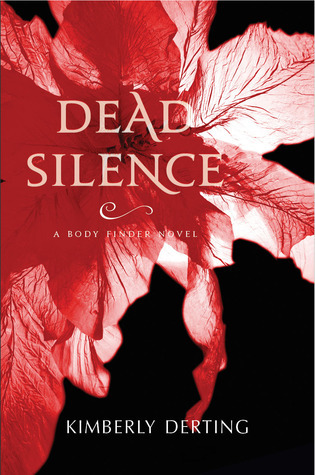 Dead Silence is said to be the last book in this series and if it is, I'm incredibly sad to have to say goodbye. Vi continues to mature as she tries to come to some semblance of peace with her gift. She has changed after her trauma, becoming more introspective after her ordeal with The Girlfriend Collector in the previous book. Living with her own imprint is a constant reminder of the life she had to take. As usual, Vi hears an imprint and searches for it by herself. She has no choice--the draw of her gift is too demanding. What she discovers inside one house shocked even me. Kimberly Derting's killers have grown increasingly worse with each book and this one is the worst of the worst. I won't expand on this but the author handles this aspect with creepy aplomb. These segments are heavy to read from their realistic depictions. Vi internally battles with her decision to remain with Sara's group. Her imprint, a sadistic killer, keeping all of this from her friends, Vi has a tremendous amount to deal with in her young life. Luckily, she has a fantastic boyfriend named Jay who steps forward to help support her and parents and an extended family who love her. Not to mention Sara and her team. Dead Silence has a slew of startling changes and additions. Vi's secret is finally found out by someone close to her. Along with Jay, Vi has help as they embark on another adventure. Vi also learns she is not the only one in her family with this gift. The addition of this discovery adds a sweet nuance to her story as she searches for understanding and peace with her imprint. Sam from Sara's group also helps Vi as revelations about other team members' families and a secret are revealed. Oh, Kimberly Derting keeps the twists and turns coming! It's been great watching Vi grow over the series and she seems to reach her limit in Dead Silence. By the way this book ends, I don't believe this is the last book in the series. Vi's implied threat leaves me smiling and needing at least one more Body Finder title. The series has gained too much momentum in this volume to say goodbye. At least, give readers a spin-off with Rafe. All i can say is the red flower and all of that black background is appropriate for this book. I picked up an ARC at a book signing event. We're giving away our gently read ARC of Dead Silence. Enter below. Open to US/Canada residents only (sorry, postage costs are high). I loved The Last Echo! My favorite was definitely The Last Echo because the cliff hanger at the end was awesome. Just makes you question many things that happened in the series and even more anxious to read the Dead Silence. I have to agree. The Last Echo was incredible and I can't wait to read this one!!! I liked them all the same they were all really good. The second one I think. Have only read the first two. Thanks! I really don't have a favorite since I have not yet read any. I haven't read the series yet but I'm dying to! I haven't read them yet. I haven't read any of them, yet.